As the holiday travel season hits its peak, air travel experts are warning travellers to be careful about what they pack. This Christmas marks the first time Canadians can fly with cannabis for the holidays. But federal rules only permit 30 grams of cannabis per person. Toronto Pearson International Airport, which expects Friday to be its busiest day with an anticipated 135,000 travellers, said passengers carrying cannabis should be aware of the possibility of unexpected penalties if a plane needs to make “an unplanned diversion” outside of Canada. “Taking cannabis or any product containing cannabis across Canada’s international borders is illegal and can result in serious criminal penalties both at home and abroad,” the airport said in a statement. The majority of passengers likely aren’t flying with cannabis. But many travellers will pack gifts for loved ones – and, if you want those gifts to remain a secret, it’s best not to wrap them, according to the Canadian Air Transport Security Authority (CATSA). "We might have to open it … and as much as we like unwrapping gifts, we'd much prefer not to unwrap yours," said CATSA spokesperson Christine Langlois. A strict ban on Christmas crackers is enforced, and travellers are not allowed to bring them in carry-on bags or checked luggage. 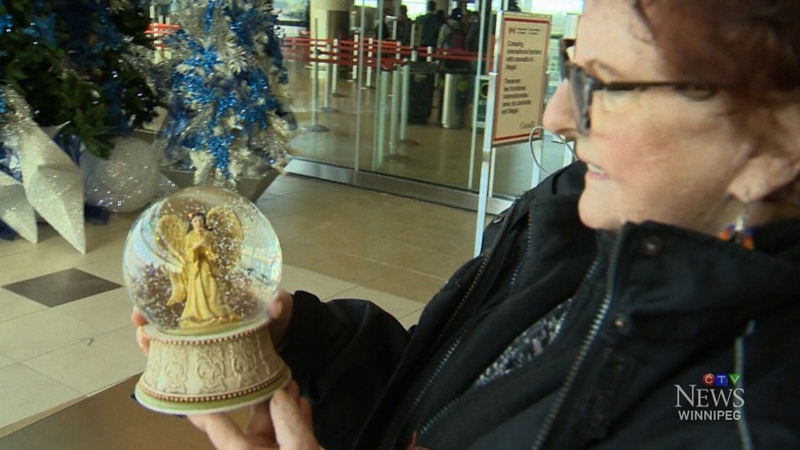 Snow globes and toys that contain water could also cause hold-ups at security, particularly if the items contain more than 100 milliliters of water. Authorities say you might also want to rethink packing large jars of jam or peanut butter, as they are considered liquids. Airports across the country are expected to be packed over the next few days, and travellers are advised to arrive earlier than usual in order to ensure that they arrive at their gate on time. “A lot of the biggest stressors we see are people rushing, trying to catch a flight. Lines are a little bit longer this time of year,” said Tyler MacAfee with the Winnipeg Airports Authority. For those travelling through Toronto, Pearson International Airport recommends that travellers reserve a parking spot in advance. A snow globe is seen in the Winnipeg James Armstrong Richardson International Airport on Thursday, Dec. 20, 2018.